System to provide big performance boost – and 20 miles EV range. The 2015 BMW M3. The next version will give its Twin Power engine a hybrid boost. Aiming to give its iconic performance model a boost while also making it more environmentally friendly, BMW will migrate to a plug-in hybrid powertrain when the next version of its M3 sedan comes to market, several senior company officials have revealed. The new system draws from both the German maker’s motorsports experience as well as some of the lessons it has learned since launching the BMW i battery-car sub-brand several years ago. Versions of the new drivetrain are expected to be used on a wide range of additional BMW models, and could be offered in both rear- and electric all-wheel-drive configurations. “We have to go that way,” confirmed Ludwig Willisch, the CEO of BMW of North America. The basic drivetrain under development starts out with a similar engine to what’s found in today’s M3, as well as the M4 coupe. For the 2016 model, that’s a TwinPower 3.0-liter inline-six engine that now makes 425 horsepower and 406 pound-feet of torque offered with an option of either a 6-speed manual gearbox or a 7-speed double-clutch transmission. One senior BMW executive involved in the development of the next M3 said the maker expects to boost torque by at least 100 Newton-meters, or about 73 lb-ft. He didn’t reveal the targeted horsepower rating. The system under development is similar to the KERS, or Kinetic Energy Recovery System, technology that has been used in motorsports programs including Formula One. Power on the M3 would remain directed to the rear wheels only, he added, as that is the layout the classic model’s fans expect and prefer. 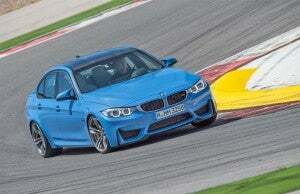 But the basic drivetrain being developed for the M3 will have significant flexibility. It could be used to offer what some call through-the-road all-wheel-drive. The rear wheels of a vehicle would be driven by gasoline power, as is the case on most BMW models today. But rather than using a driveshaft to also power the front axle, the forward wheels would be electrically driven, the BMW M executive explained. That could mean either one or two electric motors, the latter offering the ability to torque vector. In that case, more power is applied to the outer wheel during a turn to enhance cornering stability. Going to a plug-in hybrid drive system for the M3 generated some internal controversy, at least initially. One reason was the potential weight such a powertrain would add. Mass is considered an enemy of performance, and BMW has always tried to reduce as much weight as possible when developing a new version of the M3. The good news is that the latest batteries are becoming both lighter and smaller, even as they grow more powerful, another BMW insider explained. They also are becoming less expensive. Where a kilowatt-hour of lithium-ion batteries cost as much as $1,000 at the beginning of the decade, he suggested it has now come down to around $400. And the goal is “$150 to $200” by the end of the decade, though it’s uncertain that aggressive target can be achieved. To offset some of the added mass of a plug-in hybrid drive, BMW will use additional lessons learned from vehicles like the i3 and i8, the M executive noted. Those models make extensive use of carbon fiber, and the next BMW M3 will use more of the ultra-light material, as well. BMW is considered a leader in the development of carbon fiber for automotive applications. It has formed a partnership that is currently turning a pilot plant in Washington State into the world’s largest source of the material. Asked when the new hybrid BMW M3 would come to market, the senior source laughed and said, “I can’t tell you everything.” BMW North America chief Willisch, however, noted that the current version of the iconic performance sedan was only launched in early 2014. At the maker’s normal pace, it wouldn’t be due for a complete makeover until around 2020. BMW, incidentally, won’t be the only one to be marketing an electrified performance car by then. Audi is working up an all-electric take on its R8, for one thing. Mercedes-Benz may electrify some of its performance models. And Tesla has already charged into this new market niche with offerings like the P85D version of its Model S. It recently announced an update, dubbed “Luuudicrous Mode,” that will allow the battery sedan to launch from 0 to 60 in a mere 2.8 seconds. This entry was posted on Friday, August 14th, 2015 at and is filed under Automobiles. You can follow any responses to this entry through the RSS 2.0 feed. Both comments and pings are currently closed. I’ll bet BMW gets some push back from M devotees on a hybrid M3 regardless of how fast it is. For those who don’t understand, the auto makers are essentially forcing hybrids on consumers because they know they can not achieve the U.S. Obama/EPA mandated 54.5 mpg CAFE requirement. That means all cars that they sell will incur a fine based on how much they miss the 54.5 mpg mandate by. That means stickers prices will reflect the CAFE fine in addition to the thousands in price increases each year to pay for the changes required to try and achieve the 54.5 mpg CAFE requirement. The 54.5 mpg CAFE requirement has absolutely NO scientific basis what so ever and is purely a bonehead political decree by the same guy who decided he could bypass U.S. immigration law and allow 5 million illegals to live, work and collect S.S. in the U.S. even though Mr. Obama has no authority to circumvent U.S. law, create U.S. law or offer amnesty to 5 million illegals. It’s the same guy who decided 54.5 mph was a good number to blackmail consumers. So its a wailling wallfor the flat earth group today. 54.5mpg is totally possible. As already by several manufacturers. So were going to talk voodoo politics. Lets keep it on cars and nonparanoid views of world. Lets talk about the lack of weapons of mass destruction not found yet spending 1 trillion dollars about war. DWH – You need to stop with the personal attacks as your technical ignorance continues to show. I didn’t say 54.5 mpg was unattainable, I said 54.5 mpg CAFE is unattainable and it is. You obviously have a bent nose because you have been wrong on virtually every technical issue that you have commented on and I, Paul and other folks here have had to educate you on your errors. Hyping EVs because you bought Tesla stock is disingenuous and ignorant. The populace votes with their wallet and they are basically saying “NO” to EVs and Tesla for obvious reasons because EVs are impractical for the majority of the world. It’s time that you get a grip on reality and find some other place to try and manipulate public opinion about EVs because it’s not working here. As I explained to you before, attacking me or anyone else does not change reality. You are not in charge of this website or people’s comments. If you don’t like differing opinions or being technically educated, I’d suggest you not read the comments or go elsewhere. In addition you are seriously lacking in coherent writing skills from the posting above. If you can’t post comments without making personal attacks then you should not be allowed to continue posting in this blog. There are plenty of places online for socially challenged people to spew their hate and denial but this isn’t one of them. I mean BMW Going Plug-In Hybrid With Next M3 | TheDetroitBureau.com is a little vanilla.